The walks are administered by DoC, and described on their web site. However, the times shown for the walks on that page are not completely reliable, and do not agree with times shown on DoC signs along the route. 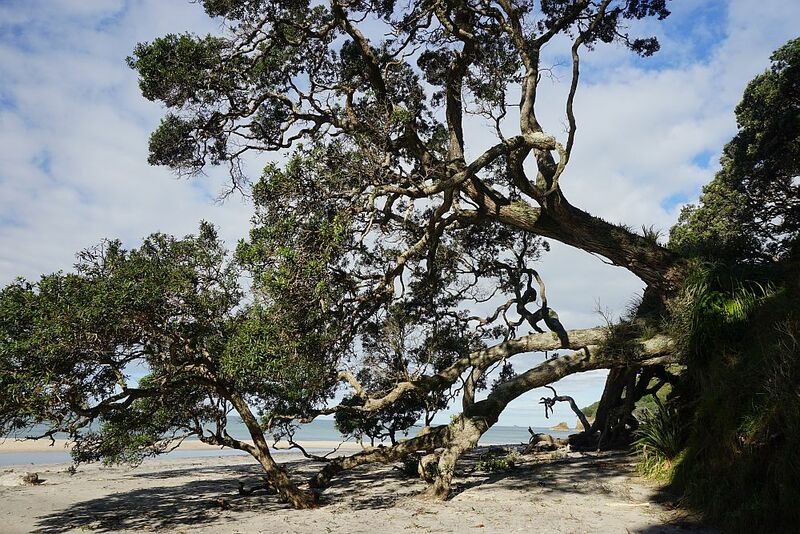 Parking is available on The Esplanade at the northern end of Waihi Beach, although it may be difficult to find a free space during summer weekends. 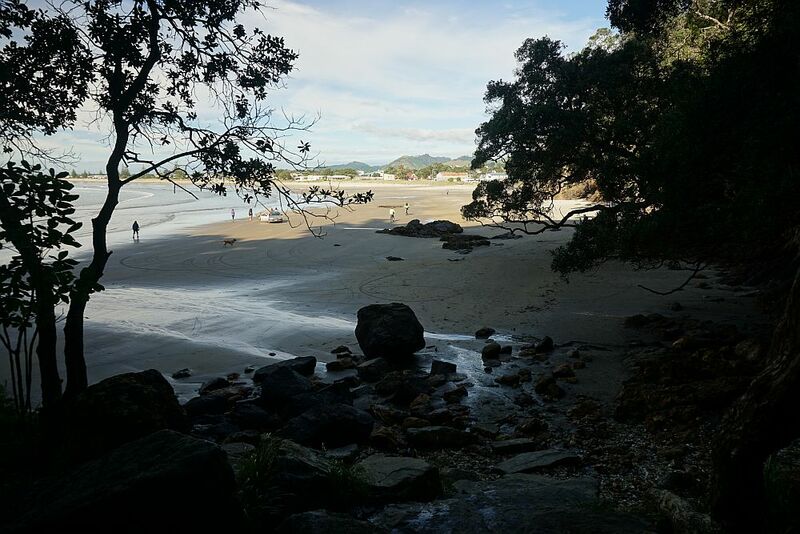 There are toilet facilities at Waihi Beach, and very basic toilets not far from each end of Orokawa Bay beach, just off the walking track, and well hidden in the vegetation. The parking area on The Esplanade. 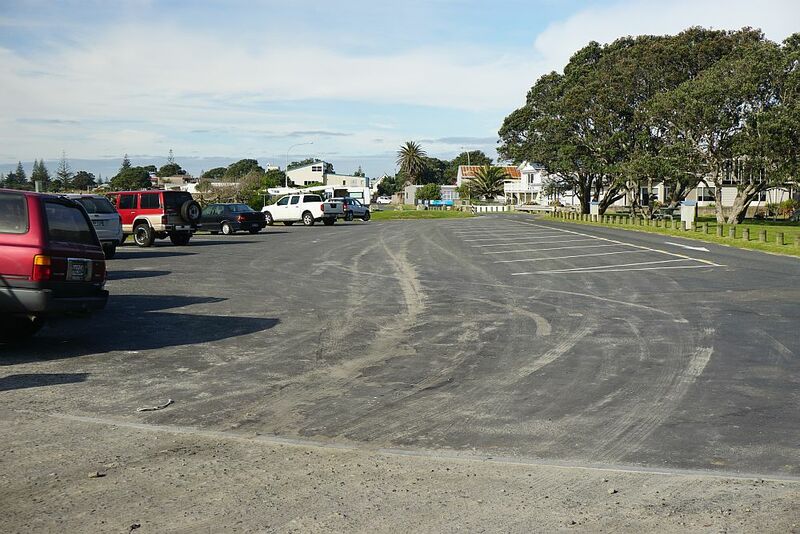 There are further parking spaces at the far end of The Esplanade, as well as toilets. 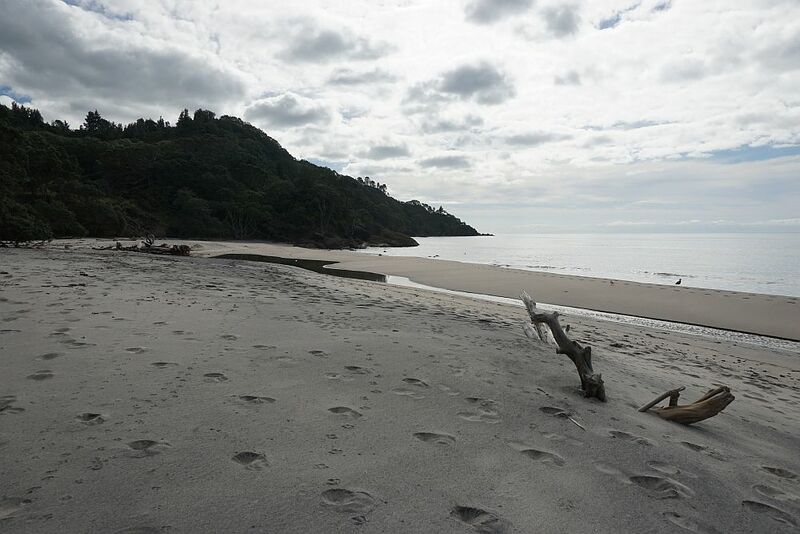 The track starts a short distance along the beach at the northern end of The Esplanade. Access can be difficult at high tide with rough seas. 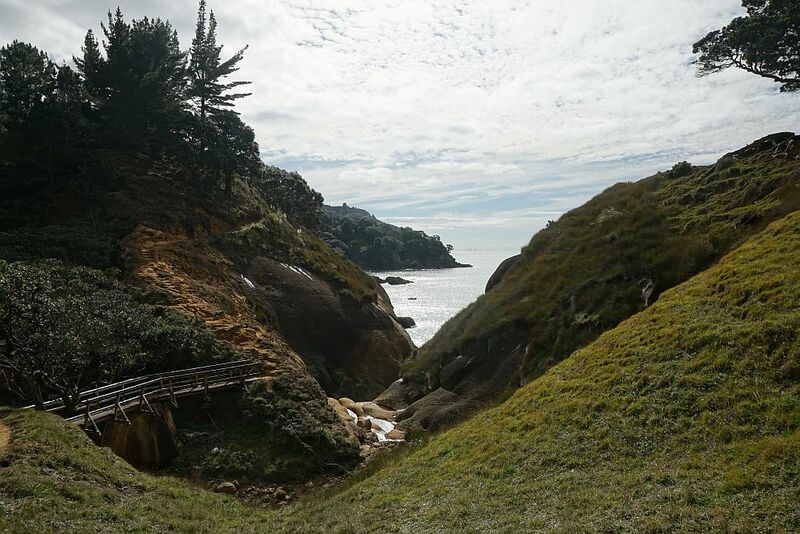 Two benches and lookout points are located on a headland not far from Orokawa Bay. 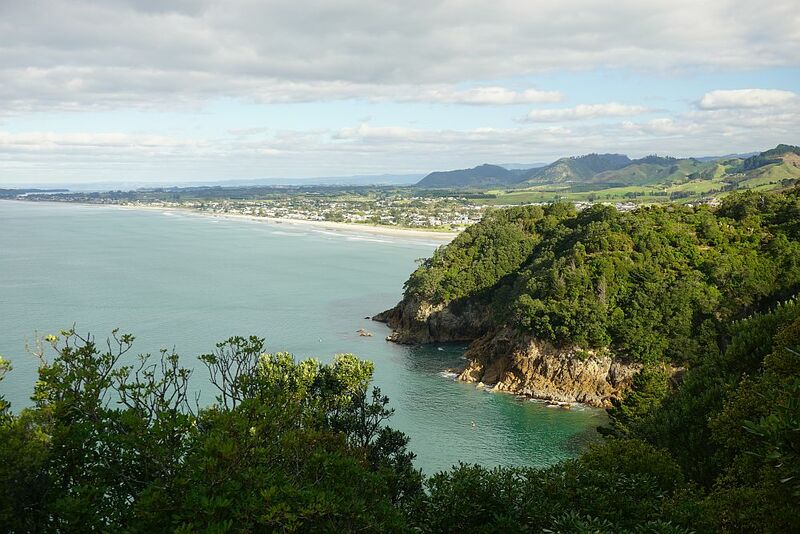 The first looks back southwards to Waihi Beach. 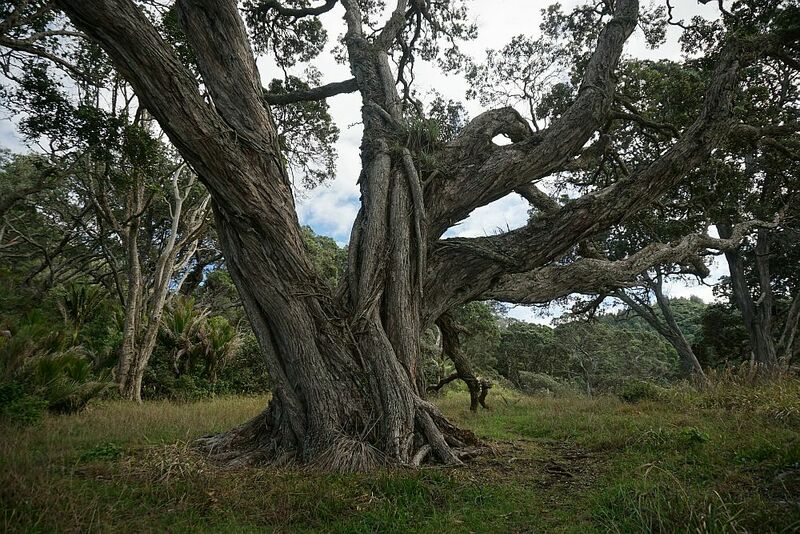 It also has a good view of Mayor Island / Tuhua. 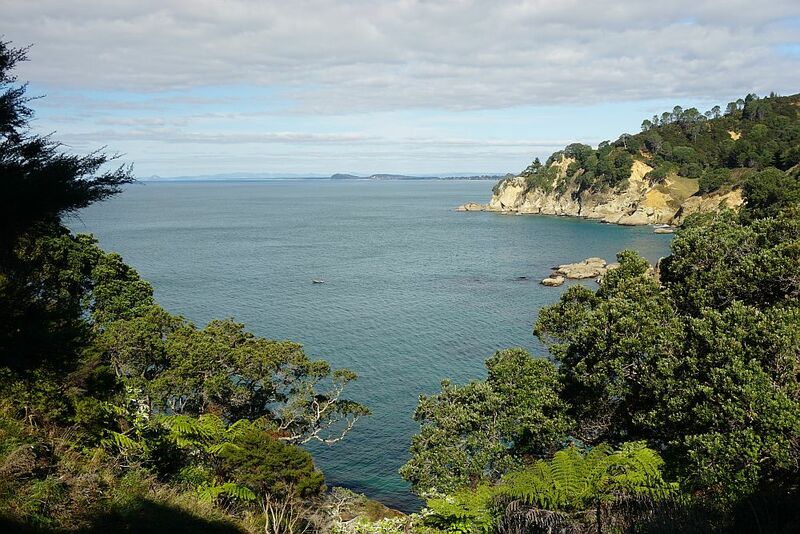 The second lookout overlooks Orokawa Bay to the north. 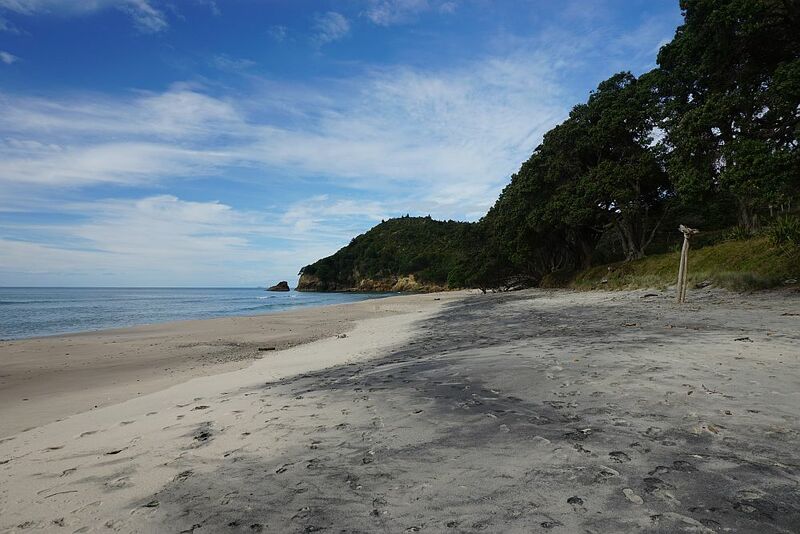 Orokawa Bay beach is the longest of the two sandy beaches. This view towards the southern end. And this one towards the northern end. 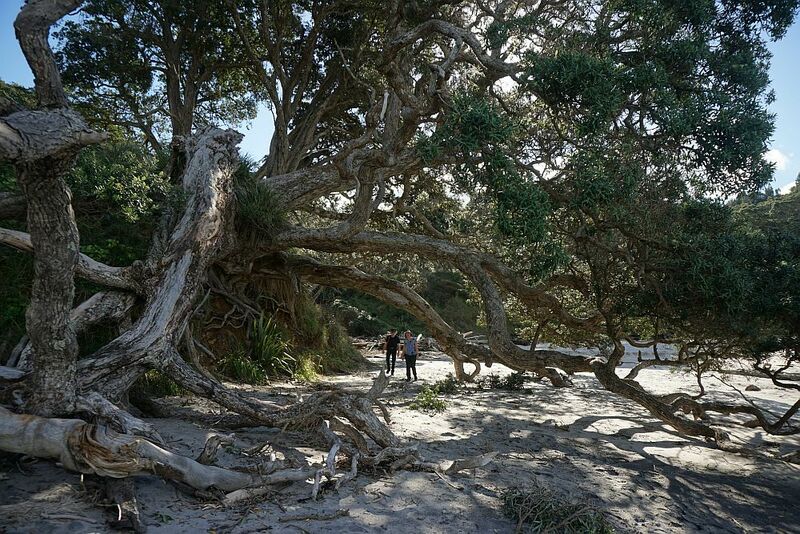 A number of older pohutukawa trees are located just above high water level, along the length of the track which runs parallel to the beach. Some of them have interesting shapes. 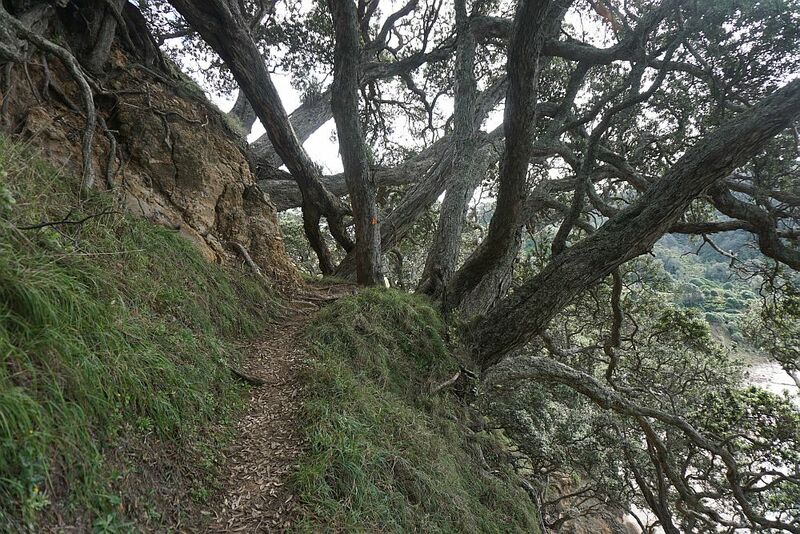 The track between Orokawa Bay and Homunga Bay is narrow and steep in places, with steep dropoffs of 80m or more to the ocean below. 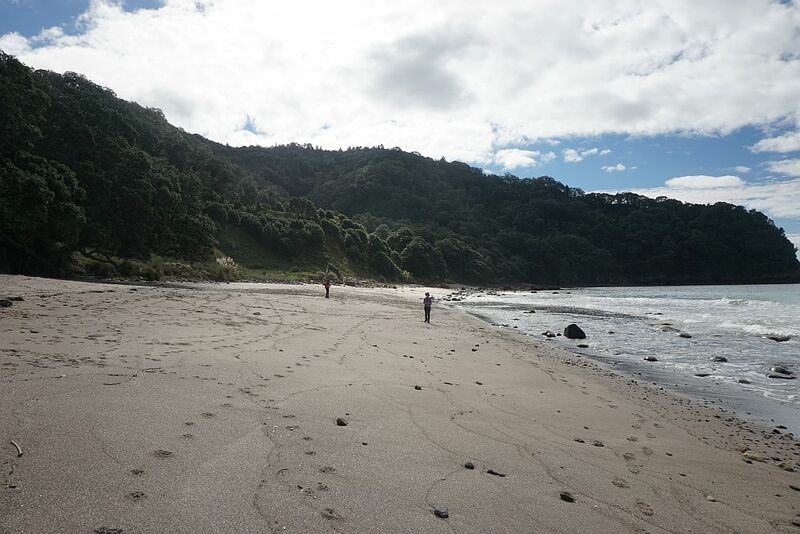 Shortly after leaving Orokawa Bay there is a good view back to the beach. 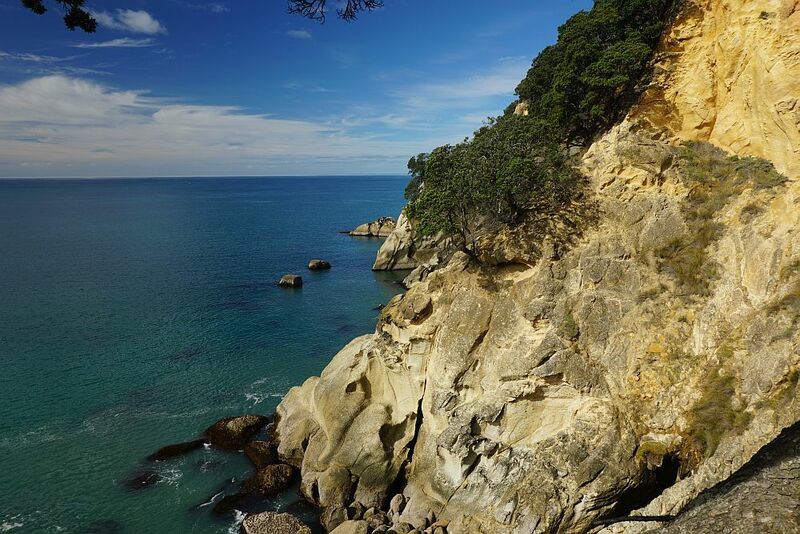 The coastline between the two bays is rugged and rocky. Slips after heavy rainfall and swollen streams are a threat to the track in numerous places. The centre of this bridge rests on a large rock in the middle of a stream. Erosion can produce some interesting patterns on the clay and rocks along the waterfront. 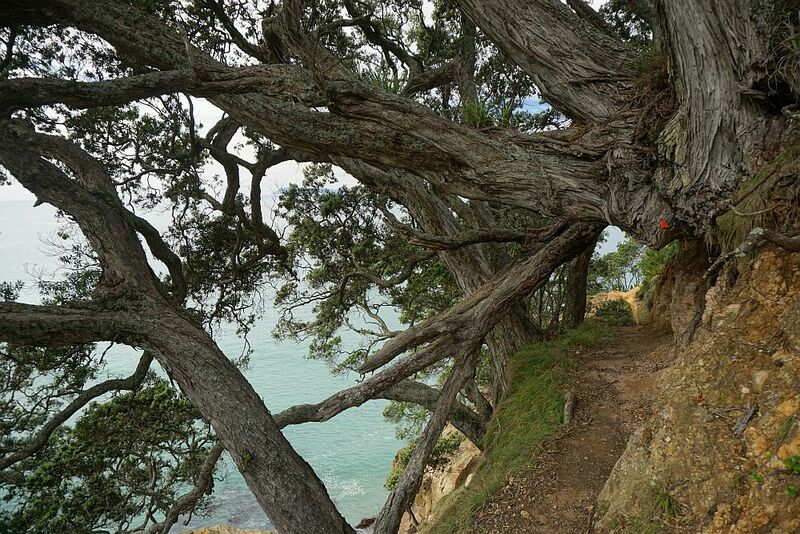 Pohutukawa trees also line parts of the walking track which is cut into the side of the cliff. 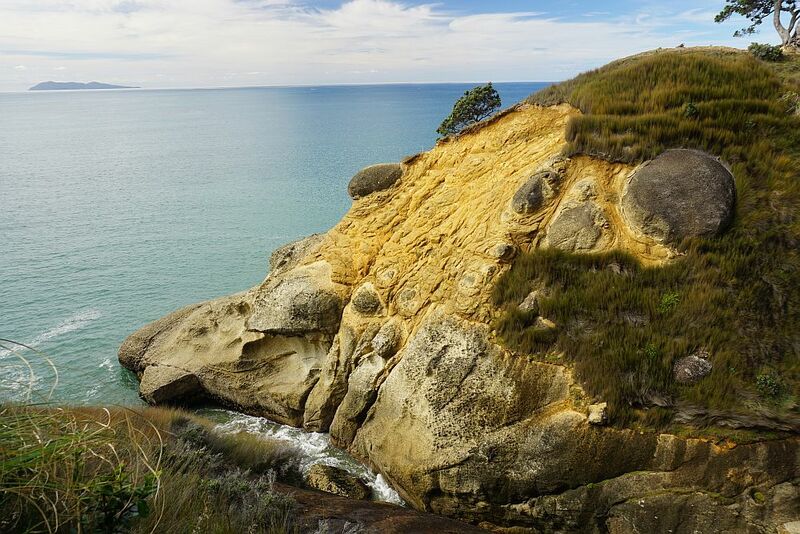 There is a near-vertical cliff face down to the ocean below the track. 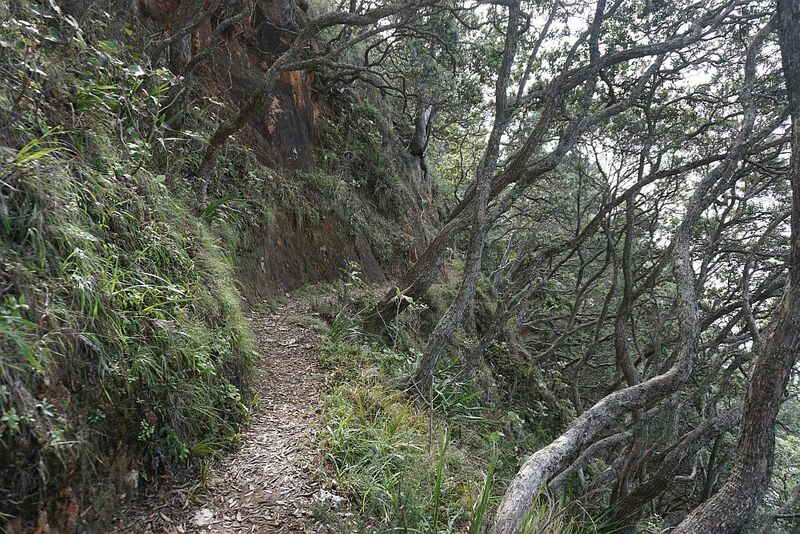 And the track is quite narrow. 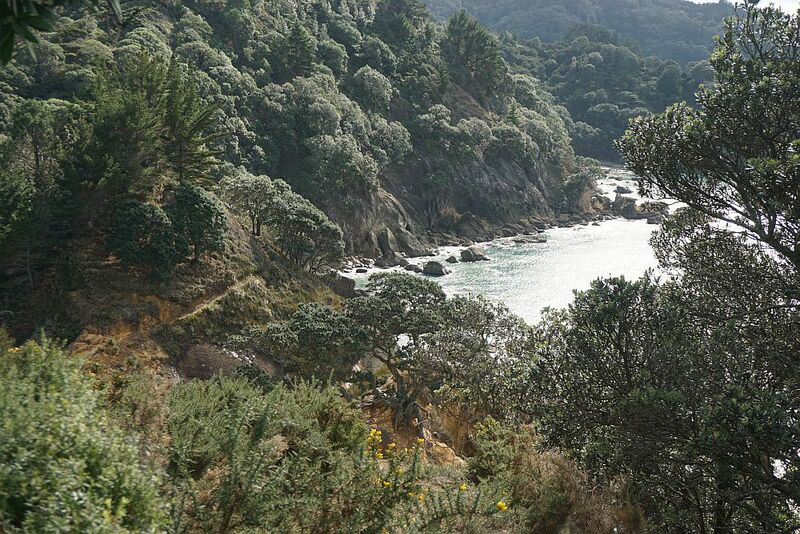 The track up the hill to Ngatitangata Rd is only about 100m from Homunga Bay beach. On this sign the walk to Ngatitangata Rd should take about 1h 45m, with a distance of 3.6km. On the DoC web site is is 45 to 60 minutes for the walk. 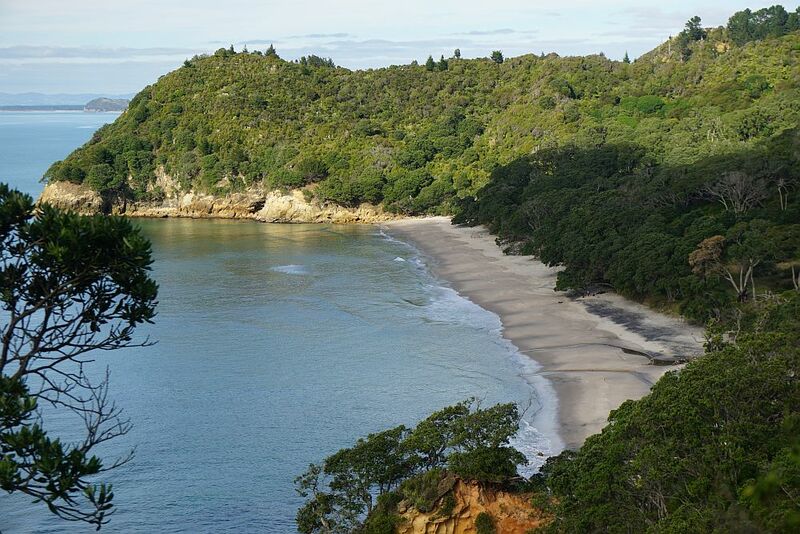 Looking south along Homunga Bay beach. 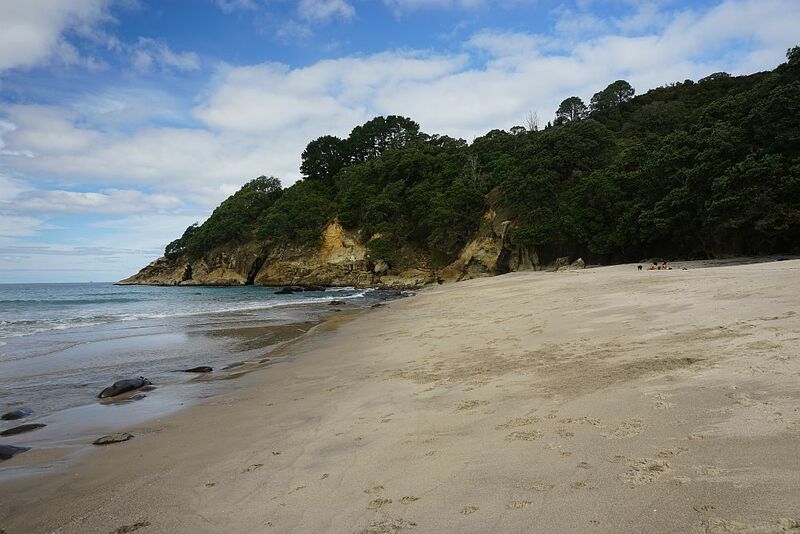 Looking north along Homunga Bay beach. 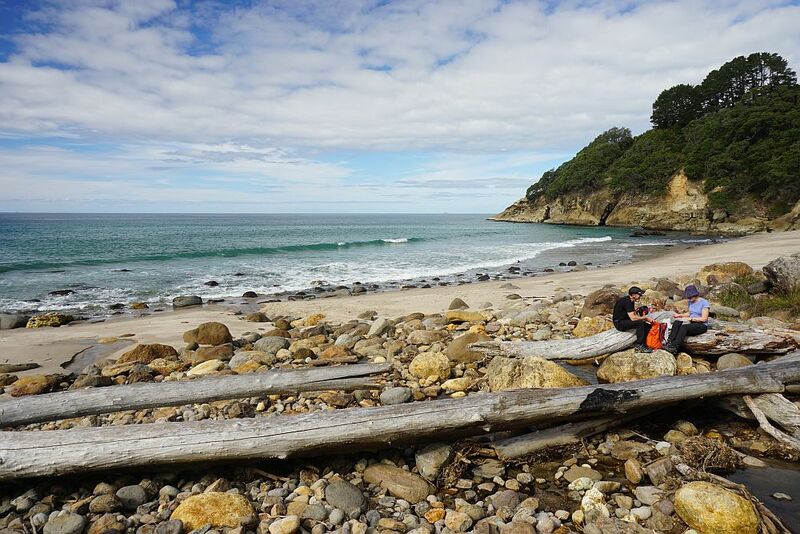 A perfect spot in Homunga Bay for a picnic lunch, sitting on a log, in the middle of a stream, listening to the ocean waves lapping the shore just a few metres away. Views to the south from the track. 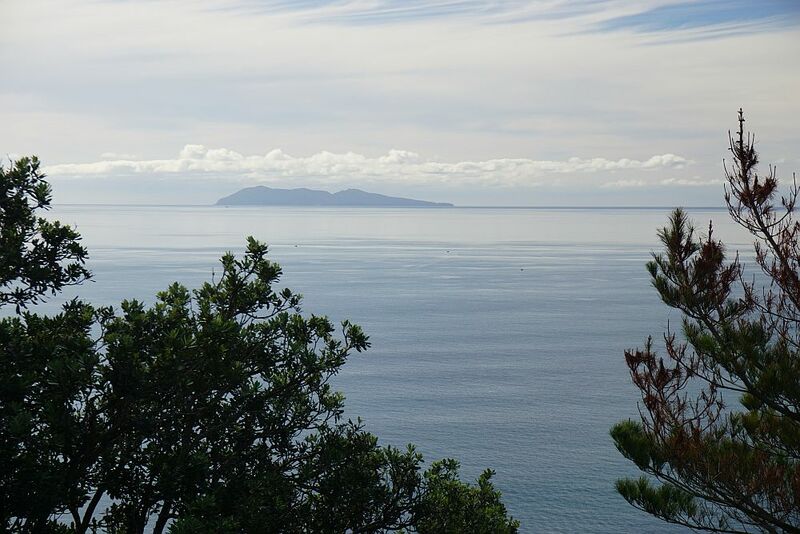 Mt Maunganui can be seen to the left in the distance. A small boat is anchored in the bay, with the skipper hoping to catch a fish or two. 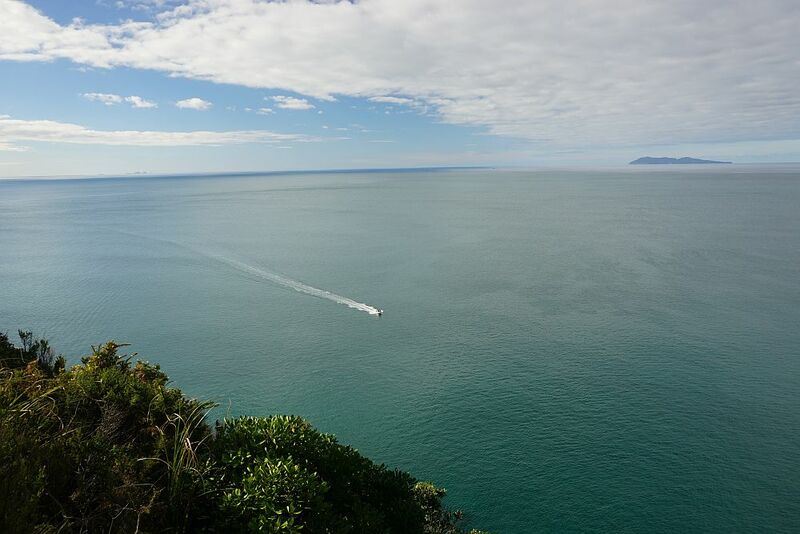 Another boat heads towards Waihi Beach after a fishing trip. 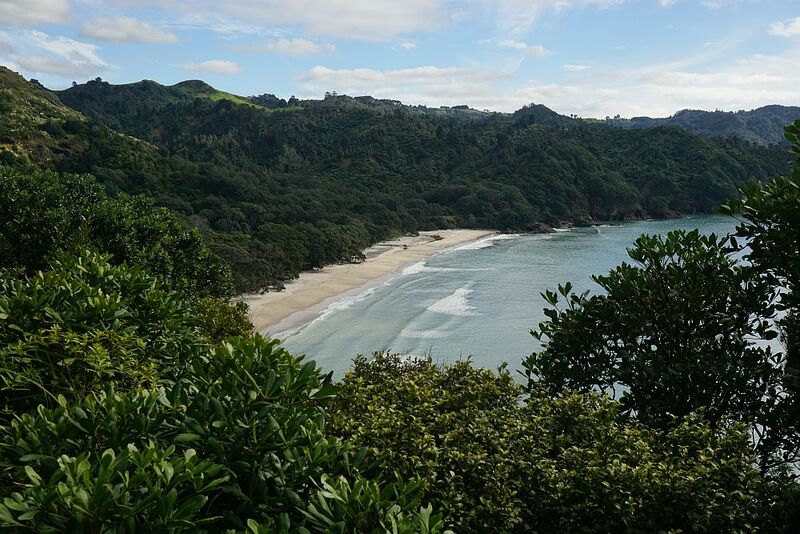 The track log shows the route from Waihi Beach to Homunga Bay and back. It also shows the track to Ngatitangata Rd and the track to William Wright Falls, which will be the topic of another post. Total time, including lunch break and a few rest breaks was just over 5 hours. The walk was done on May 3, 2015. 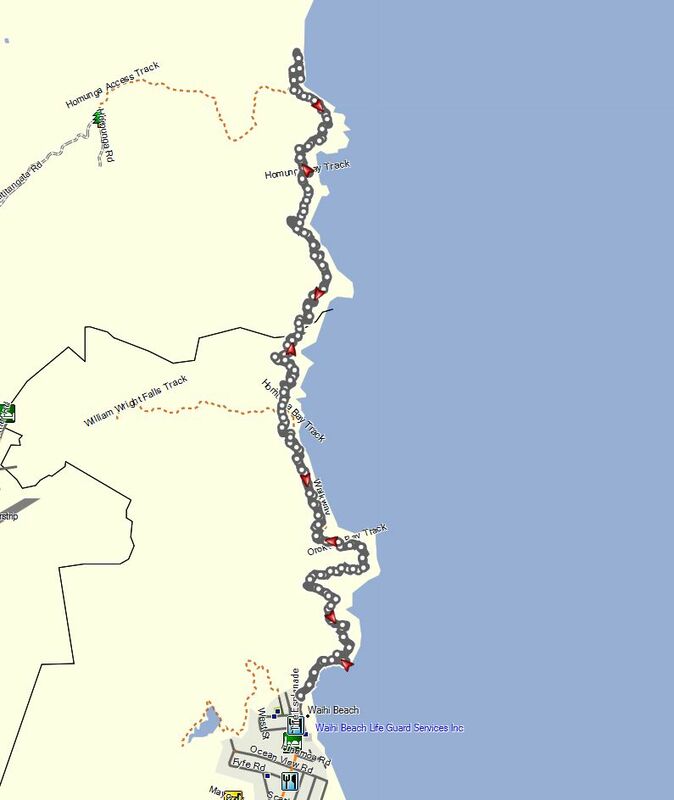 A previous walk along the same route on May 24, 2014 took about 4.5 hours. 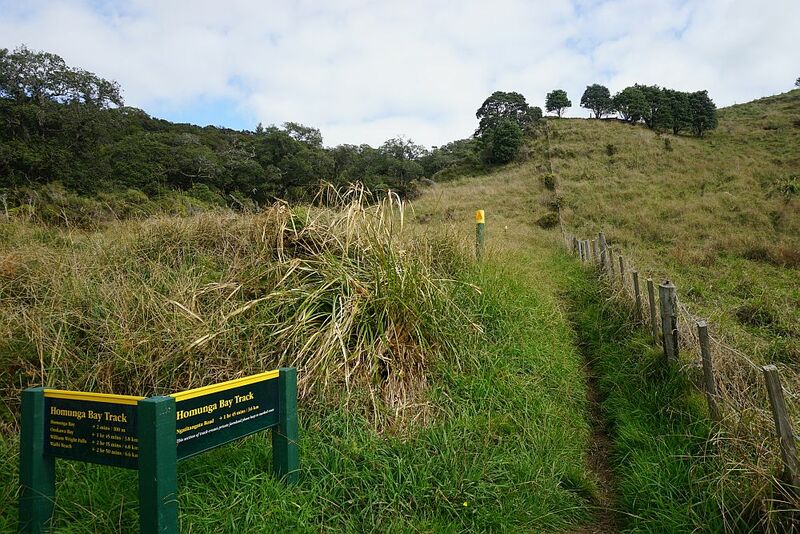 The walk from Ngatitangata Rd to Waihi Beach was done on January 6, 2011, but with no record of the times for each leg. Total distance was just over 14 km.